It's been 15 years or so since I visited Petco Park, and my impression at the time was was it was one of the better new ballparks. That was also long before Target Field, so my wife and I revisited it Sunday, to see if we were still as impressed. Went there a couple years ago. Yep, it's great. I actually think it's fine facing downtown...really hard to complain about anything at Petco. Nice review! Of all the stadiums I've been to (only seen about half) this one is my favorite. It was designed by world-class and 2006 AIA Gold Medal winner Antoine Predock. And it shows. Every corner of this place was taken into consideration. Anyone heading out to the West Coast needs to add this on their itinerary. I had the opportunity to tour it some years back, but never got to see a game there. It is a jewel in a great city. San Diego is certainly one of the points of origin of the "West Coast IPA." As much as I like hearing about other parks ... and it would be fun if enough posters could contribute to an entire series until all parks across the country are covered ... I hope we don't have too many articles that are nothing more than Twitter posts. It seems odd to call that an article, imo. Perhaps it was the easiest way to amass thoughts on the subject since they were all tweeted out over the time of the visit, perhaps giving the ‘sense’ of reporting live, but I could just follow Twitter for that. There's a reason I prefer one format over the other. Call me old-fashioned, but I actually like reading articles as opposed to a series of Twitter posts. Edit: That said, I do appreciate the ‘report’ and the information contained within. Thanks, John. The grassy area by the bullpens is really cool: you can sit and picnic like at Saints games. There's a mini diamond for kids to play on and staff on hand to supervise, too. Very family friendly. BBQ and pizza??? Dude: fish tacos. Seriously, come on. They're overpriced like stadium fare everywhere, but they sell amazing swordfish tacos at Petco. The site lines are the best, bar-none, especially along the third base line. First game I went to in like 2007 it freaked me out a little, like I felt a little TOO close considering I was in left field. I like to drink beer, but I've never drank an IPA there or been to either of the bars you're talking about. Wasn't a big fan of the Gaslamp in general, but Petco is also a quick train to/from the beach communities. Guess this is a roundabout way of saying that there's something for most tastes/preferences at the stadium and it's centrally located. Also go to a Dodgers game but the Angels stadium is very generic. The cool thing there is a lot of Angel greats are former Twins.....Blyleven, Hunter, Carew, there are several highlighted in the stadium. One of my regrets is that I didn't take advantage of the fact one of my sons went to college in San Diego, and to take in a game at Petco. It was 600 miles away, the school year and the baseball season don't overlap well, I was still in parent mode with the other kids... yadda yadda, bottom line is I didn't. but the Angels stadium is very generic. A nice way of calling it a dump, which was my impression when I went to a game there. And then of course I did so I agree that Petco is a very nice ballpark. 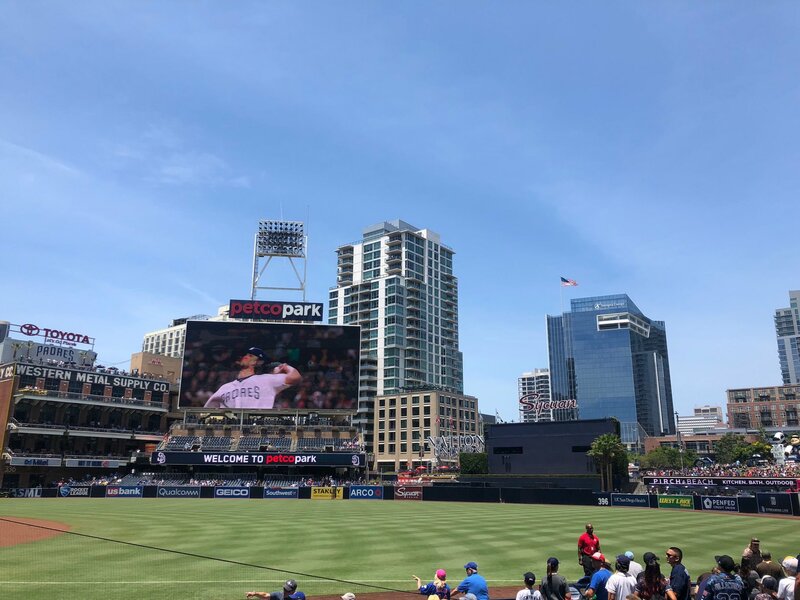 Maybe it's because I'm a Minnesotan and I'm just jealous but I guess I discount that ballpark somewhat because the weather is almost always so lovely in San Diego that they could play in a paper box and it wouldn't matter.